Super crunchy crust, on a juicy soft chicken thigh! 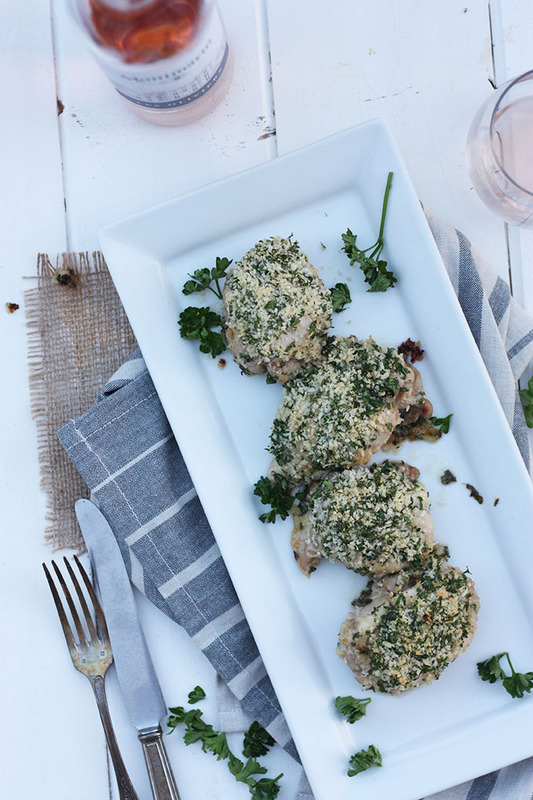 These parmesan crusted chicken thighs are ridiculously easy and so, so good! Perfect for entertaining if you need a quick and simple dinner idea! Disclaimer: This recipe is an oldie but a goodie. I originally posted this recipe on my old blog last year, but like a lot of my recipes, I’ve decided to give them a revamp and a little bit more love because they are that good! Current mood: sitting on the couch, watching Titanic, sipping on grapefruit margaritas and feeling sleepy. Thanks body clock for waking me up at 5.30am for NO APPARENT REASON! Seriously! Does this happen to anyone else? I feel like my subconscious was like ‘hey George! It’s 5.30am, better wake up because you need to clean the house because you didn’t do it last night!’. So there I was 5.45am, cleaning my house. Whyyyyyyyyy! Please don’t tell me I’m the only one? As a result, I am super sleepy, and feeling oh so lazy! But anyways, enough of me, let’s talk about this parmesan crusted chicken. Aside from posting this recipe last year, I also included it in my most recent menu plan. Why? Because this chicken is just delicious, and crazy easy to make! 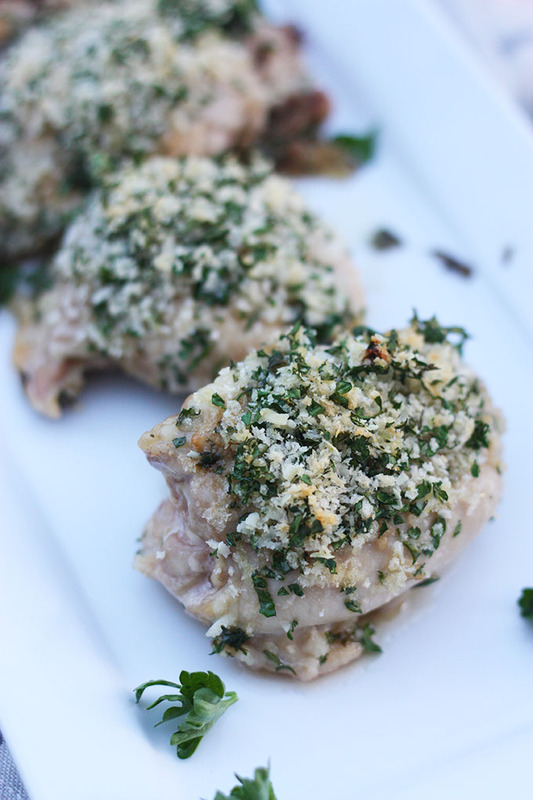 A simple combination of butter, Worcestershire and garlic, combined with a panko, parmesan crumb, this chicken is tender, juicy and crunchy all at the same time! It is divine! I have made this a few times using both chicken thighs and chicken breasts and I love using either. I do sometimes find however that one whole chicken breast is a little too much for me to eat at once, which is why I love to swap out chicken breast to thighs. Chicken thighs are perfect if you are looking to cook for a crowd, because they are smaller and won’t fill up your guests too much aka more room for dessert! I haven’t trialed the exact quantities with chicken breasts, but I am pretty sure that the quantities for four thighs would be the same for two chicken breasts. I also imagine the cooking time would be similar for chicken breast – approx. 20-30 minutes. It’s always best to check with a meat thermometer or cut one open to find out! Anyhoo, I reckon it’s bed time for this little chicken! Here’s to hoping my body clock wakes me up at a more suitable time! 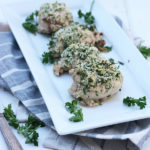 A crunchy outer layer, on a soft tender chicken thigh, this parmesan crusted chicken is so delicious and easy to make! are you drooling yet? Are you an early bird or a night owl? what’s your morning routine? You’re so not the only one! My body clock has gone haywire lately and I wake up either way too early, or sleep later than I should because I just can’t wake up at my normal time. Ugh! I hope it’s a summer thing :). I’m loving this chicken. It’s so fancy but so simple at the same time! Happy Thursday! OMG! Totally. I’ve been getting up before 5:00am ever since the birds started chirping and now of course it’s light out at 5:00 am already. At least I get more done, lol. Started a barre class:) to counter the effects of too much beer. 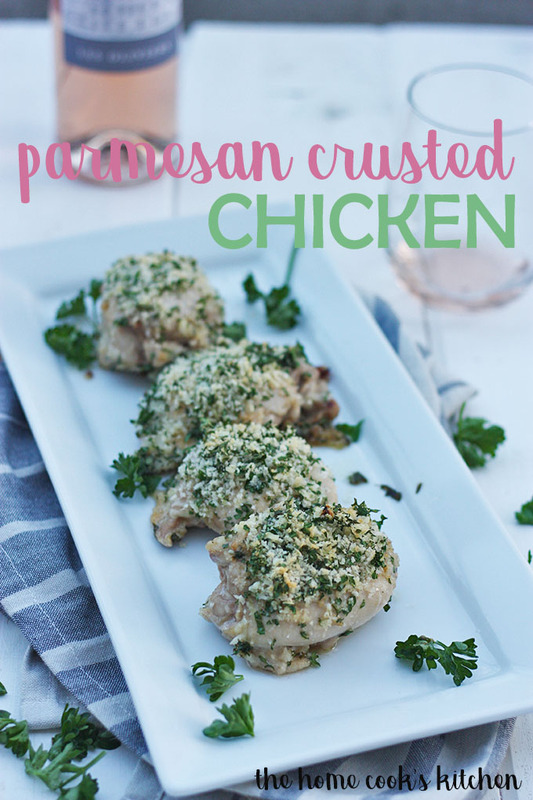 Love this chicken, I’d coat everything in parmesan if I could! I love the mornings but sometimes 530am is just too early 🙂 i am a parmesan addict too, it’s so good! 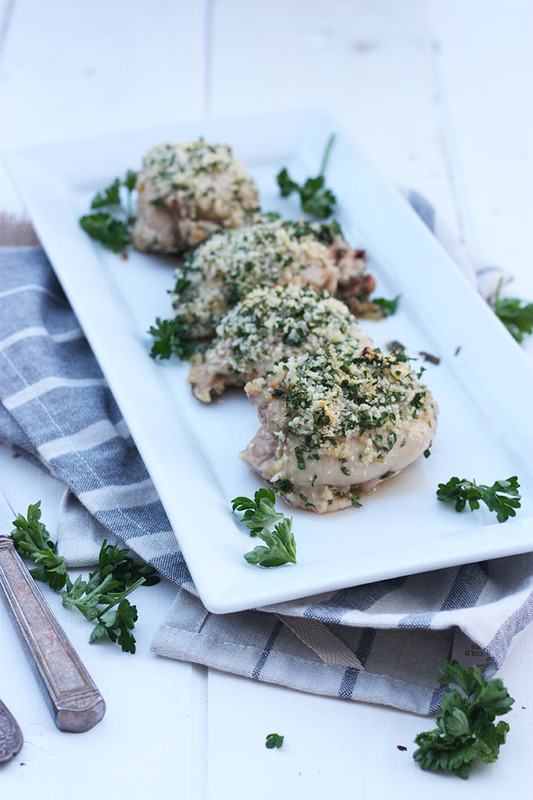 I get so tired of plain old chicken – this is so delicious looking!! I can’t wait to try it out. HOW did it take me so long to see this post! ?